Let me share a little secret with you: I’ve had my Etsy shop for over five years… but it didn’t really start to get active until about two years ago. About a year ago I started to think about blogging for my Etsy business. Then, I ready Crystal’s book Money-Making Mom and knew I had to do it. That’s all it took! Now, I’m hooked on blogging and it’s made a really good impact on my business. You’re probably thinking “I’m an artist, not a writer!” Well, if you can write a letter to your best friend, you can blog for your Etsy business. It’s that simple. Your Etsy shop has a banner, an about page, and it might even have a picture of you featured as the Avatar. That’s all good as it gives your customers an introduction to you; but, they can really get to know you, what inspires you, and trust you when they read about your Etsy business through your blog. If you’ve ever read anything about online marketing, you’ll know that trust creates sales. Once your blog is established, you can use keyword search terms in your blog post titles that will generate traffic geared toward your niche. What does that mean? It means that if you sell crochet hat patterns and post a tutorial about crocheting a hat using your pattern, you can generate traffic from those who like to crochet. And then, those who like to crochet, will visit your shop and buy one of your patterns! Etsy provides a very useful tool called “Etsy Mini”. This allows you to post your featured shop items on your blog. You can feature up to 12 items and then stick them on your blog side bar for all to see. Once you’re generating traffic from all of the cool and informative posts on your blog (mentioned above), you can then generate traffic to your Etsy shop as well and (hopefully) increase sales! Unfortunately, Etsy does not provide a tool for you to collect your customer’s email address… but you can do this with your blog. You can set up newsletter subscription links on your blog and announce coupon codes, new items added and other shop announcements through your blog posts. If you use WordPress for your blog like I do, there’s a widget you can use that allows you to add an email sign up form for visitors to subscribe to your blog. If you ever decide to branch out and use another selling resource in addition to (or instead of) Etsy, such as Shopify, Zibbet, or Amazon, you can use your blog as a general platform for your business. You can then add links on your blog directing visitors to your other stores around the web. Your customers will always have a general gathering place through your blog, so you’ll never have to worry about losing them if you branch out. 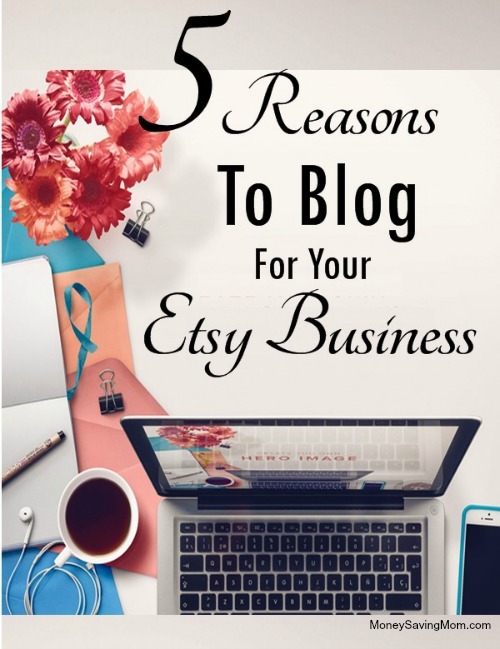 Blogging for your Etsy business is not hard. You can start by doing a free blog on Blogger.com and even keep your posts private until you feel comfortable enough to share them. This will give you practice and a feel for how it’s done. In no time, you’ll have a blog, more followers, more sales, and a whole lot of fun! Shannon is a wife, mom, part-time kindergarten aid, and an Etsy shop owner (times two!) She’s also a blogger who loves to post daily about fun Etsy giveaways. « Valentine’s Day Weekend Magazine Sale!